This isn’t really about a tree. It is, however, about the removal of something old without notification or consultation. 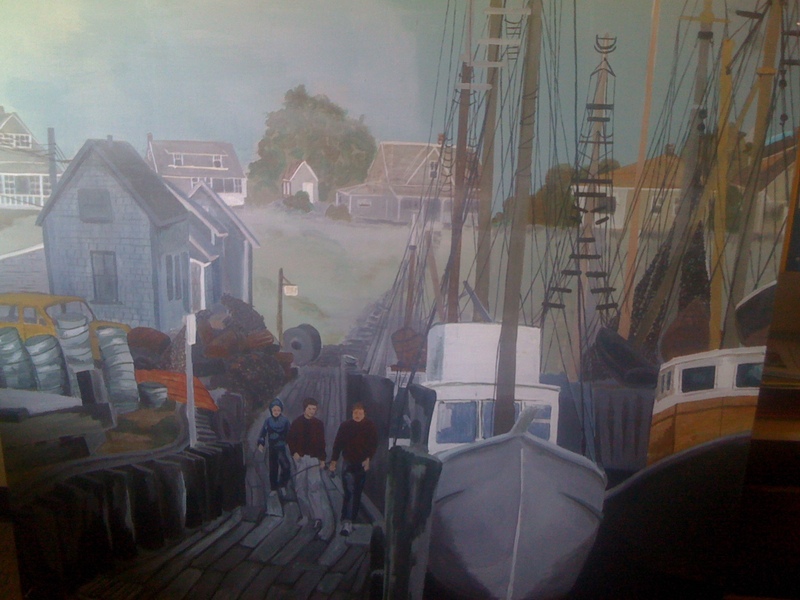 There used to be an old painting of a fish boat and dock. It was hung on the wall in the lobby of the Anthropology and Sociology Building. But now it is gone. Sometime in the next few days a brand new wide screen T.V. will take the place of the old painting. We will have entered the new age world of digital communication in which digitalsignage ubc, the faculty of arts, and the departments of anthropology and sociology will pump in special messages to keep us all up to date on all of the place of mind adds and informercials we need to view 24/7. It’s a small thing (the issue, not the painting). In the greater scheme of things it’s not all that important. Yet, I feel there is something underlying the removal of the painting that at least speaks to a wider issue here at ubc and in this sense is similar to what is happening to trees on our campus. 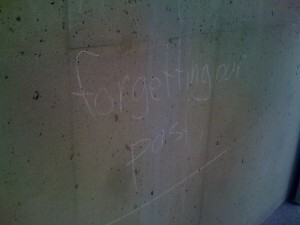 Our history is being erased. An old tree is removed and then replaced with a smaller one somewhere on campus. An old painting is taken down and replaced with a digital sign. The names of old buildings and places are deleted (anyone remember the Ethel Wilson Sound Recording Library?) and those with money buy the opportunity to have their name put there instead. And then we forget. New people don’t know the past. We have lost the markers and the capacity to speak about what was. The way it is is the way it has always been. Orwell commented upon this in his distopian novel 1984. Of course most later day readers will see that novel as a critique of communism. From the vantage point of the digital world where news is ephemera and the past dissolves and is remixed with out reference to any sense of time Orwell’s ministry of truth speaks to our present as much as it spoke against a mid-20th century form of state socialism. So what was that old painting which is now stashed in an empty office awaiting its future disposition? Can I even remember it accurately enough to say anything of value about it? The painting reminded me of this place, coastal BC. Even though the world that it depicted -an old fishing boat and a harbour- is a world long passed into history; it is the world that I grew up in, the world that shaped the way in which I think and act, the world that plays a strong role in how my intellectual work proceeds. It was in short an image that made me feel welcome in the university. I grew up in northern BC in a decidedly working class community and family. UBC has always been a special place for those of us born and raised in this province. I think that UBC is more than just an ‘excellent’ university; it’s our university, it’s BC’s university. Yet, it was also a foreign place filled with unfamiliar things, and -most exciting- opportunities. In a strange way that painting was something familiar that reminded me that UBC is still our university even as our university leaders seek to enter that privileged international circle that leaves much of BC’s heartland out in the cold. I suppose that my colleagues who come from afar or my students who have grown up in a different BC may not have even noticed that old painting. They may not have even liked it. I don’t know. I never asked them. I am sad now not to have asked. I wonder if people will notice the absence of the old painting this September with the start of the new school year. As they walk by will they notice the bright light of the new screen; will they stop to wonder about what may have been there before? Or will the painting and that BC that I come from slide even further into the mist of time, erased from our view; just another victim of progress. Thanks for the post on the roll-out of signage. It’s important to look at all the impacts of this change. We’ve linked to your blog post from our main Digital Signage site. Well said Charles, I too felt a strange comfort in that painting. Perhaps you can convince the powers that be to have some visual anth programming? Thanks for the commentary Charles— I too felt a jolt last week when I saw the bare cement wall space where the oil painting had been. A sick-to-my stomach feeling that the hand-craftedness of human creativity is inexorably being replaced by the computer-produced and the screen-worlds. More and more I feel that I move from the screens of computers in my office, to screens in the classroom slides, screens replacing the yellow pages, books, fold-out maps, etc. etc… screens creating a jittery flat and deeply boring material environment. Recently coming back from a field site where I was away from screen-worlds for weeks on end made the contrast that much greater. Though I’m not necessarily contra a digital sign, I am sorry that it meant taking away that idiosyncratic, BC-rooted, personable and colorful oil painting.